In Safari, visit a website that you want to store as a bookmark. A website is a collection of one or more web pages. If you want to bookmark a news website, for instance, you should use the top-level landing page as the bookmarked page instead of a web page that’s linked to a specific article. Choose Bookmarks→Add Bookmark to open the dialog shown in the figure. Or you can right-click the plus-sign button that appears to the left of the address bar and choose Add Bookmark. By default, the Name text box displays the current web page’s title, which is typically the main website’s name. You can also add a bookmark by simply clicking the icon to the left of the URL and dragging it down to the Favorites bar or into a folder in the Bookmarks section of the Sidebar. (Optional) Type a new name for the bookmark if you don’t want to keep the default name. 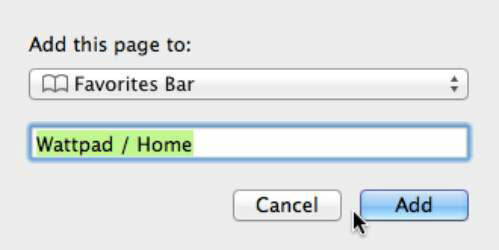 Click the Location pop-up menu and choose a location for storing your bookmark. You can choose the Favorites bar, the Bookmarks menu, or a specific folder stored on either. Your new bookmark appears where you placed it. Turn on Safari in iCloud on your Mac and your iOS devices, or Safari on a Windows computer with iCloud, to sync your bookmarks across all devices.